The Hashery is a new independently run restaurant created by the “cuartro amigos” four thirty year olds who have worked in Cardiff’s food establishments and decided to put their experiences into their own restaurant. Located on High Street in the city centre the Hashery’s aim is to be somewhere for the people of Cardiff to retreat to after work with cocktails or celebrate events with friends. The goal for the restaurant is to ‘make every visit memorable” and my visit was certainly that. I met a friend after work to go and try out the Hashery’s food and cocktails. We had previously walked past the restaurant and were interested in the piles of guitars at the entrance and the graffiti so we knew this would be an interesting venue. On first impressions the restaurant looks like a clash of ideas rather than collaborations. The decoration ranges from mirrors next to tables, comic books glued to the ceiling and graffiti on the walls. Then there were guitars and various other string instruments being propped up as reserved signs. There really seemed a lack of focus about what the theme of the restaurant was. Unlike a restaurant where you know the theme so expect some wacky features the layout and decoration of the Hashery just didn’t work in my opinion. The focus on the decoration meant that small things like the furniture seemed to be ignored. We were sat on a rather wonky table with old wooden chairs that weren’t very comfortable. The clash of ideas wasn’t just reserved to the decoration and theme but also to the menu. The main specialities served are burgers and mussels. Now forgive me if I am wrong but this seems to be an attempt to be quirky and out there taken to the extreme. First we chose our drinks. The cocktail menu looked standard with classic cocktails but also some unique ones that had interesting names and combinations. The great thing about the cocktails is that they are 2 for 1 all day and are all £6.95 which is reasonable for cocktail prices. Unfortunately I was maintaining a strict dry January but my friend obliged to drink for me and ordered the Pirate juice. This is a mix of navy rum, fruit juices and grenadine. It looked very professionally made. My friend enjoyed it she said it was fruity and sweet. Although she had two they weren’t majorly strong. For starters we shared some Hashery Nachos at £4.50. The portion was massive, the plate full of nachos that were covered in salsa, guacamole and cheese. The salsa stood out, it was chunky and spicy and the jalapenos added a punch of heat. With the amount of nachos on the plate I thought perhaps it needed some more cheese but overall it went down well. If you aren’t majorly peckish and were just after a cocktail I would recommend having the nachos on the side or to share as they take the edge of the cocktails. Our mains arrived while we were still eating the nachos. I decided I would try out the Mussels, as there were five different flavours. I chose the Thai green mussels at £9.95, which were mussels in Thai green cracker with 27 ingredients. It was also served with a piece of ‘rustic bread’. This appeared in a massive covered pot. As I removed the lid a steam full of spicy fragrance hit me in the face. It smelt amazing and tasted just as good. 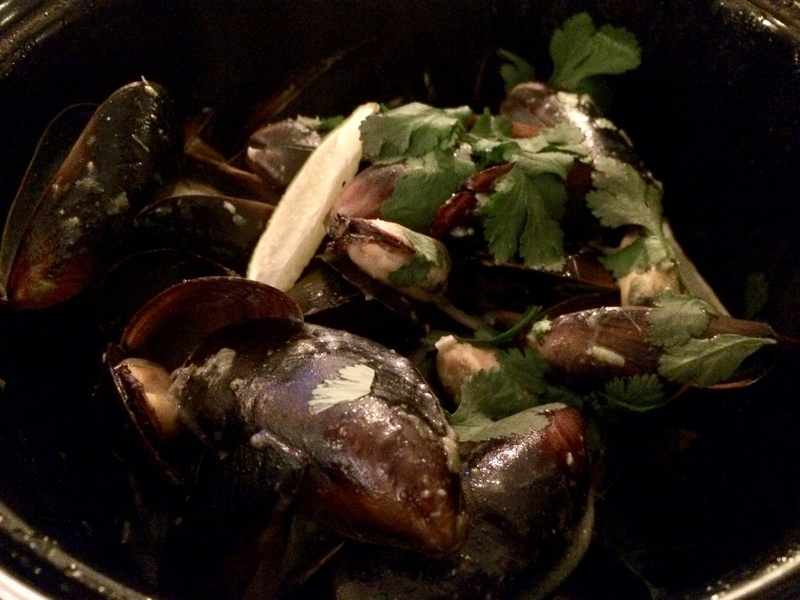 The mussels were cooked perfectly and carried the beautiful spices. The overpowering flavours were of coconut, coriander and lime that were delicious. The portion was massive because of this the mussels at the bottom had began to get cold by the time I got to them. I really enjoyed this dish and was full after them. However, the bread that came with it was boring, dry and chewy. My friend went the other way on the menu and order the Hashery Classic Burger at £6.95. This is a homemade 6 0z beef patty, chiffonade lettuce, tomato and homemade mayo. Unfortunately the burger was not served with any sides so we ordered the dirty fries at £4.50 and the onion rings at £3.95. My friend wasn’t too impressed with what she described as a bog-standard burger. She felt that the whole dish was dry especially the bun that only had a small amount of mayo on it. She also wasn’t impressed with the onion rings that were thin and incredibly greasy. However we both liked the dirty fries that were smothered in smoky barbeque pulled pork. I think if my friend went to the restaurant next time she would try a different burger with a few more features. We decided to share the churros for desert at £4.95. Churros on a desert menu are an instant winner for me and I wasn’t disappointed when the hot sugar-coated goodness was served. The churros came with chocolate dipping sauce and overall were a perfect end to the meal. They were hot doughy goodness with the ideal amount of crunch and soft texture. It was also good to see that they were not as greasy and underwhelming as the onion rings were. Reflecting on our meal there are definitely some areas that showed that the restaurant has potential. These were the mussels and cocktails. However there are a lot of elements, which are confusing and lack focus. I think there is a lot of work and decisions to be made for the owners that I mentioned in the feedback card, which they handed to us with the bill. The service was good. We chatted to Oscar and he was really friendly. There were some minor mishaps happening around us however, there are definitely no major complaints. Its great to see people investing in Cardiff’s food scene with independent restaurants but I think the Hashery have a little work to do if they want to battle with the existing competition and become a major player in Cardiff. Previous Pizzas and Pies the Stable Diet of 2017. Next Spicy and Fragrant; The Thai House. It’s frustrating isn’t it when you go to a place like this. You’d almost like to take them in hand!